We are offering Spike Guard - Extension Socket to our clients. Banking upon our vast knowledge and experience, we, "Shweta Electronics" established in 1982, have been able to manufacture an expansive assortment of Electrical and Electronic Cords & Accessories. With the use of cutting-edge technology, we have been able to develop innovative products. 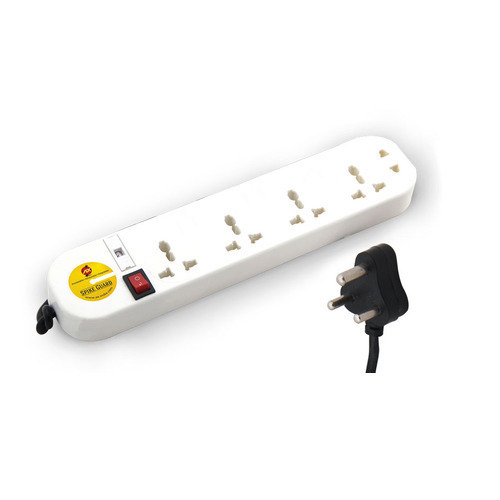 Our range comprises Power Strip, Spike Guard, Voltage Converters and Mains Cord. Additionally, we also offer Multi Plug, Audio Video Selector, Plugs & Switch and Cord. Our range finds extensive application in commercial, residential and industrial establishments. Developed after comprehensive research, our range is known for delivering excellent and reliable performance. Our diligent team, advanced manufacturing facility and stringent quality control system give us a competitive edge-over our industry counterparts. Owing to our resolve of achieving maximum client satisfaction, we manufacture the products after understanding the requirements of our clients. Furthermore, we are capable of customizing the products as per the specific requirements of the customers. Our organization is poised to be the market leader and has established its strong presence across the Indian Subcontinent. With the help of our incomparable products, we have earned loyalty of reputed clients like Aditya Birla Ltd. and Finolex Cables Ltd.